This morning I got up early even though we did not go skiing. I saw that there were some clouds. When my mother got up she said it looks like the sun is hardly out and I told her that it is slightly cloudy. When we turned on the radio they mentioned the today will be a partial eclipse of the sun. And then finally someone said it is almost over. I rushed to the window and saw the last bits of it. Really nice! If I would have known earlier then we probably could have seen the 80% coverage that had been visible in southern Austria. Well the next full eclipse of the sun visible in Austria will be in 80 years. The past few days have been very cold which has made very beautiful ice roses grow. I have not seen so many of these. They look almost like a coral reefs made out of ice. We took a walk down to the bigger village. 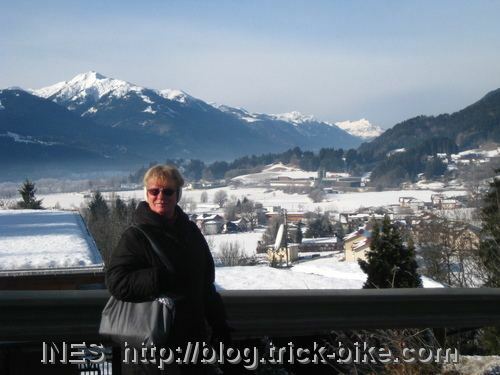 Here is a picture of my mother with the Gailtal valley in the background. The family went together for a nice local meal at a restaurant a few villages away. They forgot to give me a side dish salad so then we got a wheat beer for free. And I had to realize that coke is more expensive than really good beer. 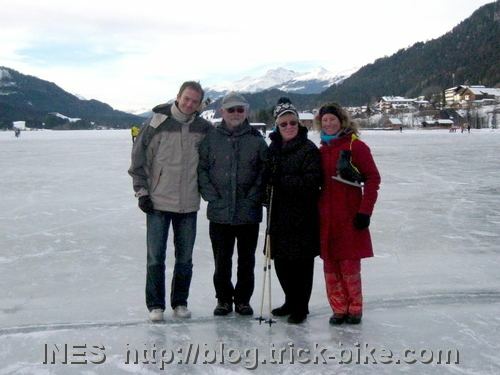 We then drove to the Weissensee, a big lake of Carinthia that is frozen in winter. It is very romantic there. They have sleighs pulled by horses running around on the frozen lake. They are really on to lake! We heard that we can just rent ice skates at the sport shop on the northern coast of the lake. But as my mother gave me her ice skates we only needed to rent skates for Julien.When we entered the sport store we saw a huge empty shelf and the lady said she has only 1 last pair for rent but they are size 39. She said we could take a seat with teh others and wait for ice skates to be returned. As the sunwas about to set soon behind the mountain ridges we did not want to wait. So Julien and my parents walked on and around the lake. While I went for a quick spin on ice skates on the 4.2km long loop. That was really nice. The rest of the evening was packing suitcases and having a nice last dinner. It was such a great relaxing holiday. And it was so nice to spend so much time with my parents. Looking forward to them coming to Beijing in April this year! 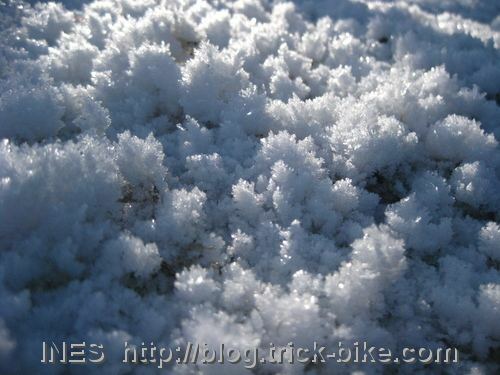 This entry was posted on Dienstag, Januar 4th, 2011 at 23:57 and is filed under Austria, Outdoors. You can follow any responses to this entry through the RSS 2.0 feed. Both comments and pings are currently closed.